When I said I did a thing...I really meant I did a thing. This "thing" to me is quite revolutionary! I would say just as revolutionary as Tandoori Grilled Cheese, and that is saying A LOT. So let's get to it. 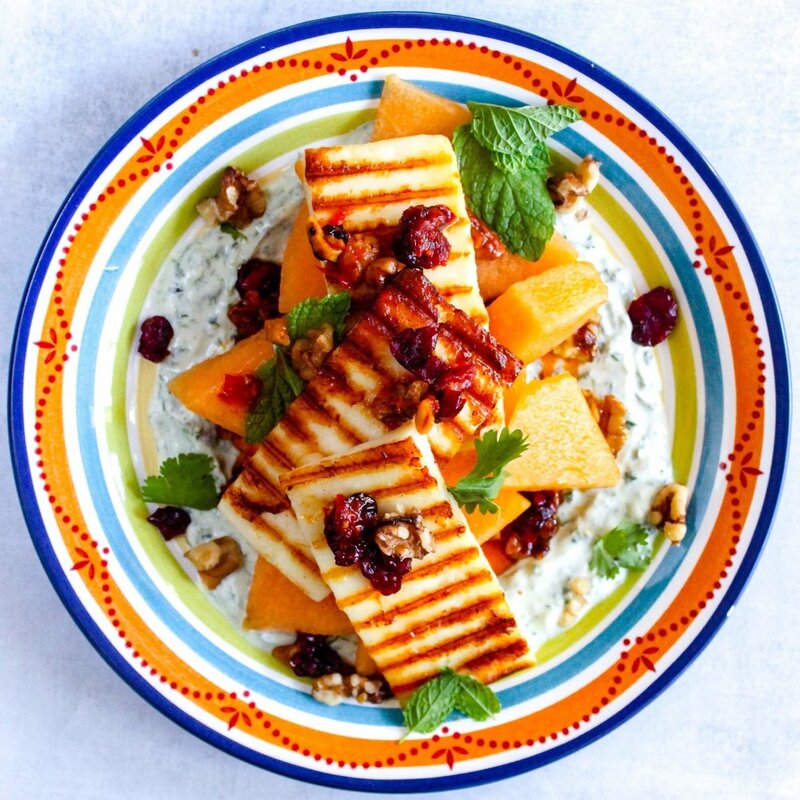 There is so much buzz around Greek halloumi cheese, but why is no one talking about using paneer just like halloumi?? It's easy enough to find (Whole foods, Costco, local Indian grocery stores), and it works so well in salads! In two separate bowls mix together ingredients for the yogurt dressing and harissa dressing. 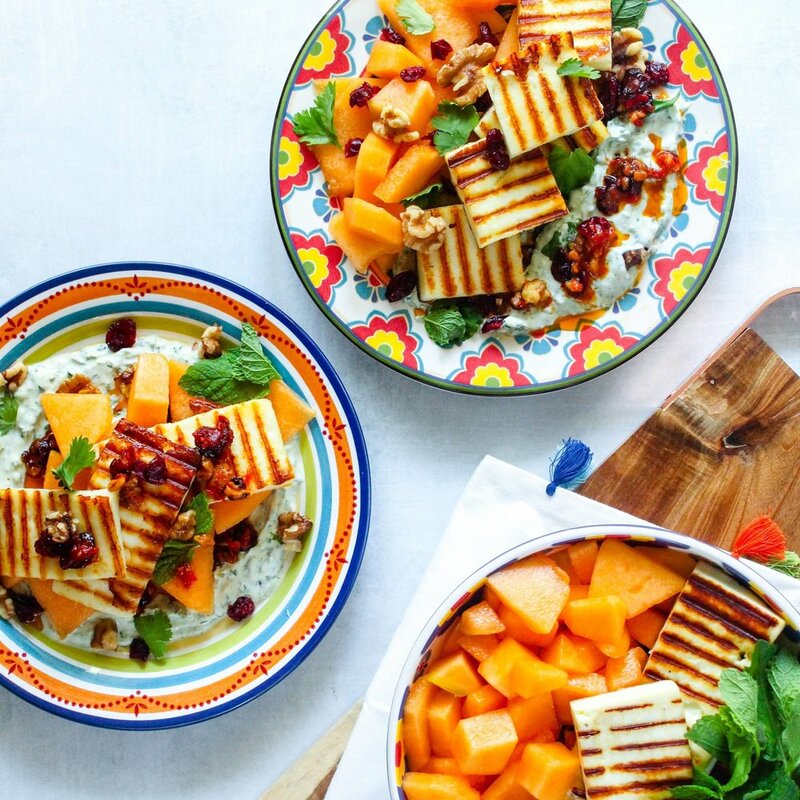 Slice paneer into about 8 pieces using a serrated knife. You can make them square, or rectangle...whatever floats your boat! Lightly oil the slices while your grill (or indoor grill pan) gets hot. Cook paneer at medium-high heat until you see nice golden brown grill marks. Flip and repeat. Place grilled paneer on a plate and sprinkle with salt. Alternatively, you can pan-fry the paneer until lightly brown on both sides. Be careful while cooking since paneer contains some moisture and the oil may splatter. Assemble salad with melon, paneer, and sauces! Garnish with more walnuts, cranberries, herbs, and even avocado!!! I smashed some avocado into the yogurt dressing when eating leftovers, and it was oh so delicious! You can use your toaster oven for the walnuts, or lightly toast them on the stovetop. This doesn't take long at all so keep your eyes and nose peeled! If you grill or pan-fry the paneer it can get dry and hard so it's best to do this at medium to medium-high heat. The process only takes a few minutes!